The Yarn Harlot was talking about project monogamy (and her utter lack thereof) on her blog and I was feeling very at sea because I’m a one-project kind of person. Yessir, that’s right. I cast on, I knit through, and only when I’ve finished what I’m working on do I move on to the next project. Can't relate to the whole ‘multiple projects’ issues, not a bit. Oh, really? Let’s take a quick look through the house, shall we? Then we have the ‘portable’ project, which is a pair of socks. See, I was going to do the alpaca scarf and beret next, but then I realized that I actually had the socks actually on the needle, so I faithfully set aside the alpaca (on different needles) to resume them. Then I found this little gem lurking in my actual knitting basket. This would be my ‘One True’ project that I was working on before I took up the Olympic sweater – this is the front of a very nice mohair-blend sweater. Isn’t it a cute little cable? Yes, I thought so too. Right up until the moment I abandoned it. I found an alpaca sweater being knit in the round that, after a bit of consideration (and the discovery that the pattern had long ago gotten separated from the work in progress), I tore out to recover the yarn. And, there is also the May Queen pattern I wrote about a while ago. 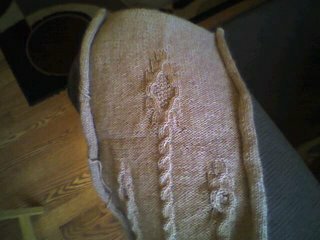 I had actually cast on the hem of that little dress before I realized I had a ‘broken’ pattern. That’s six projects in progress, for a ‘one project at a time’ person. Yes. 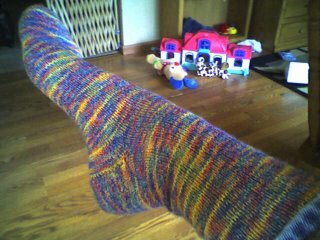 I have more of this kind of ludicrously variegated, “you're not really going to wear those in public are you?” sock yarn. And in my mind, I’m already knitting it up. HEY Those socks are great!!! Is that the famous Pergo playroom floor in the background? Looks great - just like real wood. I adore the socks, and yes, I would wear them in public. Then again, I live in New York. I absolutely love the cabling on the mohair sweater. I have a bit of a hostile relationship with mohair at the moment--call it Lamb's Pride Worsted Overload--but that sweater sure looks fabulous. As an aside, I've heard that "flyaway" fibers like angora are not safe for babies because they mess with the baby's breathing. I'm not sure if it's the case, but you may want to ask your pediatrician. If I'm wrong, I apologize. I love your blog name. It reminds me of Set from Egyptian mythology. Love the socks and yes, in public, sure, why not? Tell me, do you ever have to unravel mohair? This particular mohair is fairly easy on me - it's a blend of only 15% mohair, so it isn't Super Fuzzy. Now, This One Time, I did a cardigan out of "real" Uber Fuzzy mohair. I swore (with great feeling) I would never work in mohair again, until such time as I was a *perfect* knitter who never, EVER made a mistake that required repairing. It was worse than glue. It was like trying to unravel a steel wool pad.